I’ve written two articles on several guns that make very frequent appearances in games I enjoy playing: The SCAR rifle and the Mac-10 SMG. This almost requires that I write third third article on the final member of the triumvirate: The M1014 shotgun. (We’re not counting the AK47, its popular enough that nobody’s surprised it appears in every game ever). In most games, the M1014 fills the role of the balanced upper-tier shotgun; there’s nothing wrong with it in particular, but some other gun might trump it in certain stats. 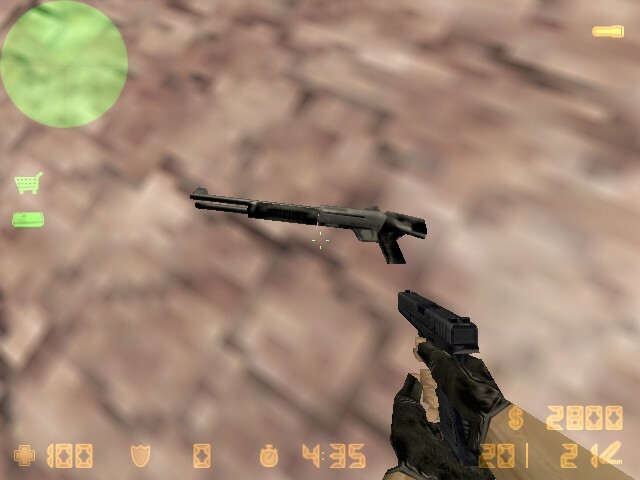 In the original Counter-Strike, the XM1014 was one of only two shotguns in the game, and the Leone 12G was simply the cheaper pump-action option for those who couldn’t yet afford the XM1014. It fired very fast and reloaded quickly, though it suffered from relatively low ammo reserves. Left 4 Dead was originally inspired by a Counter-Strike mod, so it’s little surprise that its weapon roles were mostly migrated over. The shotgun setup was identical, with the M1014 serving as the more powerful alternative to a pump shotgun, and with an amazing 128 rounds in reserve, it dominated the crowd-control gameplay and remains the greatest gun in that game. When migrated over to Left 4 Dead 2, the gun saw a slight ammo and damage reduction, meaning that it competes directly with the new SPAS Combat shotgun. The gun also appears in both editions of the other zombie horde series on Steam. The Killing Floor combat shotgun was added on my birthday 2011, and most people agree that it’s not really worth buying. It’s not sufficiently different from the starter shotgun to warrant wasting dosh on; just save up till you can get the AA12. This philosophy carried over perfectly to the sequel, Killing Floor 2, where once again nobody uses it in favor of the kickass Boomstick. In general, the middle children of that game’s perk trees struggle to establish any meaningful identities. This mod on the L4D2 Workshop can give you the golden KF shotgun, the classiest iteration of this gun ever. Speaking of which, the M1014 in Payday 2 was one of the guns added in the Gage Shotgun Pack, and once again it was a decently reliable all-purpose shotgun nobody used because there were other guns that did things better, particularly the Locomotive secondary shotgun or the high-concealment Raven primary. The IZHMA shotgun in particular has almost the same stats but way more modifications, allowing more versatile builds. At least the M1014 got some cool skins. Everytime I use it, I get annoyed because certain cops die in two shots when other shotguns could have done it in one. Speaking of skins, let’s come around full-circle to the latest CS game, Counter-Strike Global Offensive, where the XM1014 retains its track record of appearing in every iteration of the series. Retaining its decent stats, it nonetheless sees relatively little use due to shotguns not factoring in heavily to the metagame. Its price tag just doesn’t justify the purchase, and if you really want a shotgun go for the MAG-7 or Sawed-off, which will reliably obliterate an opponent in shotgun range. I genuinely find it fascinating how several relatively-uncommon weapons like the SCAR, Mac-10, and M1014 appear consistently in games across developers, franchises, and generations of gaming. There are so many guns to choose from, what causes developers to keep picking the same ones? I suppose the rationale is different for each gun. For the M1014, I think it’s just how much it looks like the archetypal shotgun. Sleek chrome barrel, efficient and minimalist frame, and a distinguishable folding stock to give the gun identity. I also think the original Counter-Strike might be partially responsible, as every single game in this article takes some inspiration from it. But it’s weird, despite its ubiquity I almost always prefer some other shotgun. I think the problem is that it’s a versatile shotgun, but shotguns themselves are a specialized weapon class when you have assault rifles competing for your loadout slots. So if I’m going for a specialized gun like a shotgun, I want one that excels in a certain category, be it single-shot damage, pellet spread, or firing speed, and I’m going to pick whatever shotgun does that over the M1014 that can do a little of everything.